Nothing beats a “Theme Party” in my book. And what a bonanza for wearing a hat! 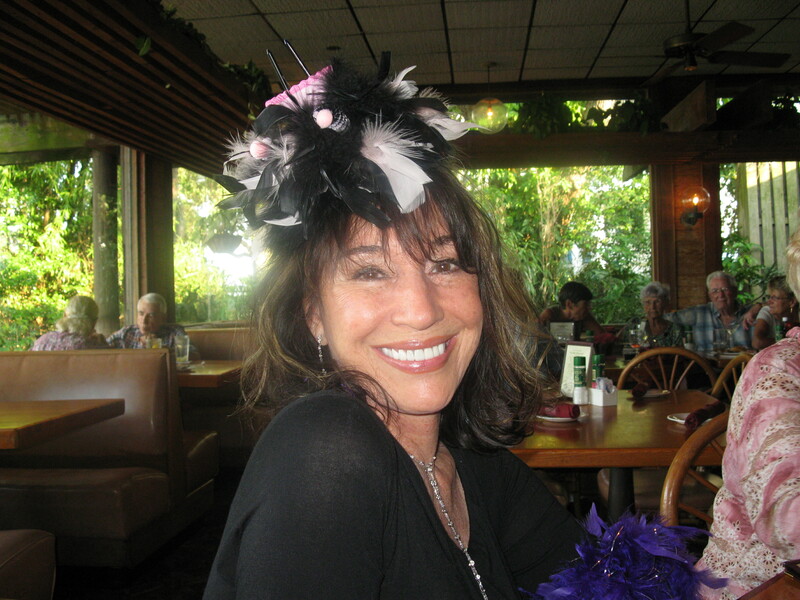 I have several very special theme hats, like my “Carmen Miranda” hat, hats for movie themes like “South Pacific” and “Out of Africa”, and of course, vintage hats of the 40’s, 50’s etc. I intend to show you all of these hats, and others, along the way. However, I have recently had the opportunity to wear what I would call “whimsical” theme party hats. My friends gave a birthday party for me at a local Bayshore Restaurant. I decided to wear my “Birthday Cake Hat”. 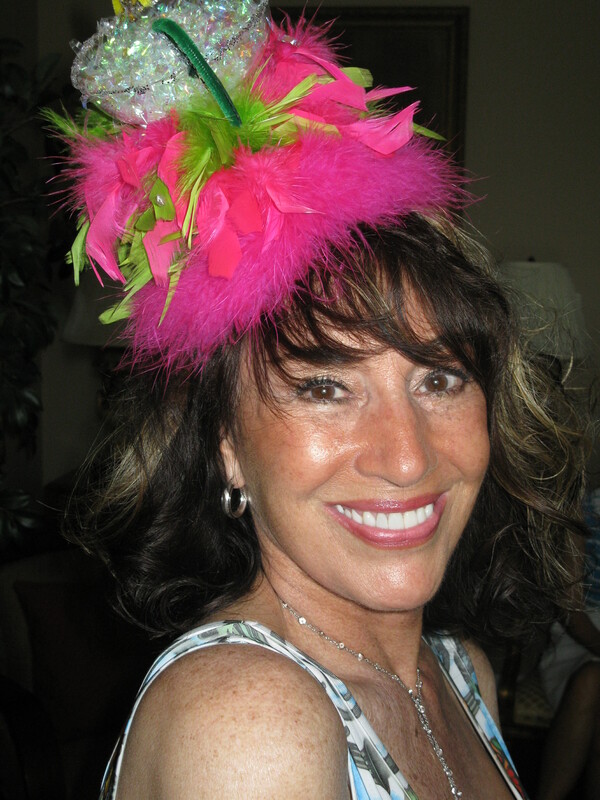 This creation is a black and pink feathered hat, designed with a faux cake on top, including candles! It is worn on your head slightly forward and at a tilt. I wore a black mid-length jersey dress with black Manolo Blanik open toe heels. I have learned to invest in a few really good shoes that can be worn with many different looks. They really do make a difference! My outfit caused quite a ruckus ( in a good way ) in the bar before we were seated. Much picture taking occurred and there were many questions and compliments for my hat. 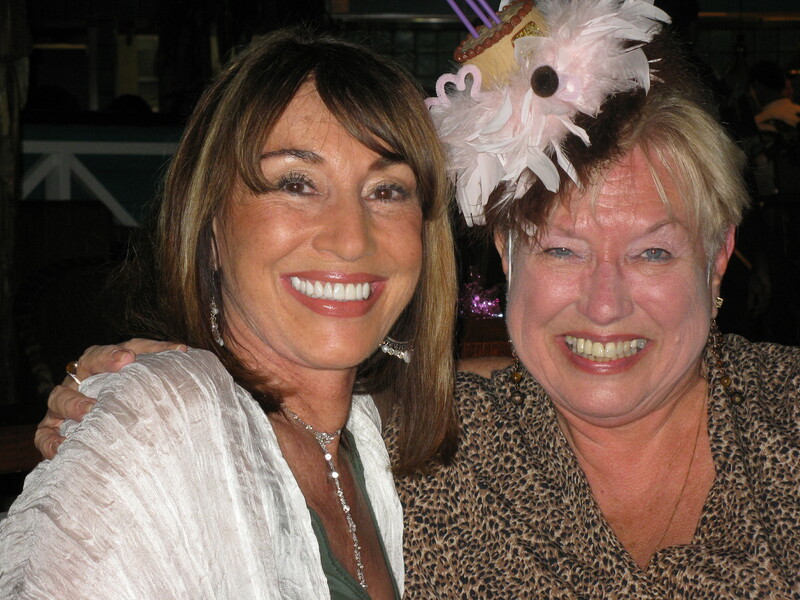 I gave my friend Shirley a “Birthday Hat” for her party last year and I’m sure you’ll agree – she looks “saucy”! You might think that it takes some serious “attitude” to wear such a hat but – believe me – after the first few compliments, you will feel just the way I did. I felt cute and playful. I wore my “Margarita Hat”. What can I say? 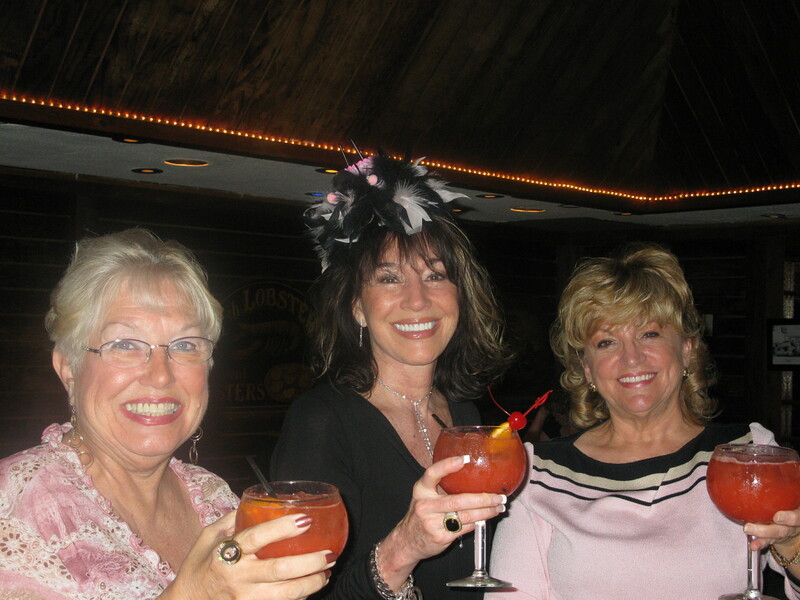 – it is a pink feathered hat with a faux Margarita on top, complete with glass, ice and a lime! I wore a vivid print sun-dress with comfortable but cute sandals with heels. All of my guests loved my hat. 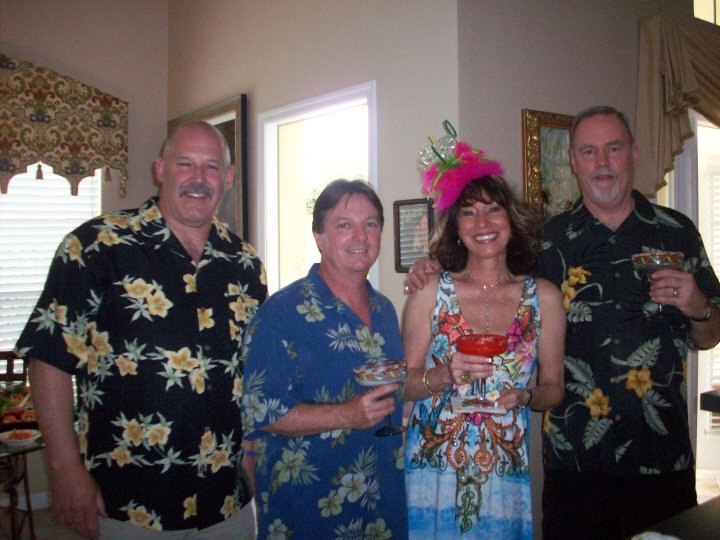 I felt like singing with Jimmy Buffet. (and later I did). This was one of the best parties I have ever had. It started at 4:00 and there were still guests here at 9:30PM. My secret weapon? – the karaoke machine! 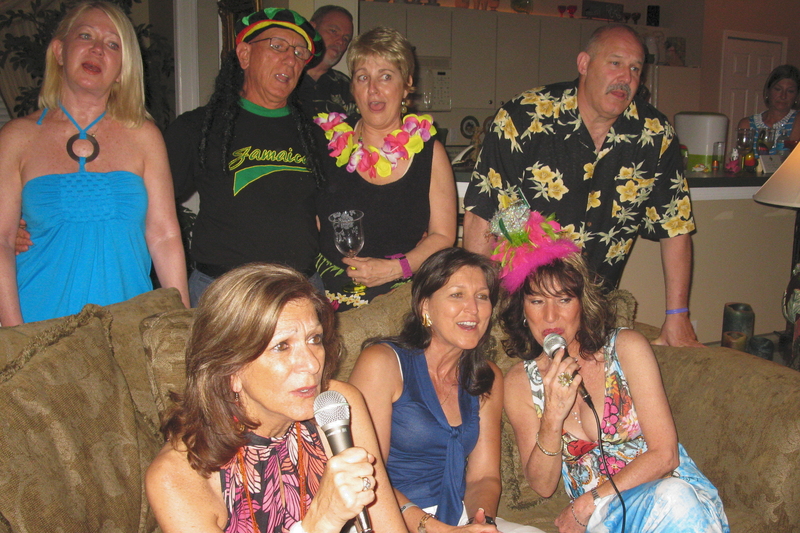 Don’t laugh – after many Margaritas and glasses of champagne and wine, friends who said that they would NEVER sing, were grouping up for sing-alongs and even grabbing the microphones away from each other! I hope you enjoy the pictures. Everybody was a star. Even without a hat! Love the Margarita hat! Your friends at the bar a beautiful. 🙂 Can’t wait for the next posting.